Use of the Internet to research a service or product has increased significantly. 83% of Internet users have researched a product online as of December 2002. That represents growth of 52% from 64 million who had done product research online as of March 2000, to 97 million who said they had done such research as of December 2002. Online men are more likely than online women to have used the Internet for product-related research. The higher an Internet user’s household income and education level, the more likely it is that he has done product-related research. Those with the most experience online and those with broadband connections are more likely than others to do product-related research. While researching a product or service has consistently been one of the most popular online activities since 2000, the number of Internet users who have turned to the Web as a resource for product information has increased notably since 2000. In March 2000, 74% of Internet users (about 64 million people) said they had looked for product information and in December 2002, 83% of users (about 97 million) reported they had done such online searches. Similarly, 14% of Internet users (about 12 million) reported looking for product information on a typical day in March 2000, while 19% (about 21 million) said they did so in December 2002. Men with Internet access have invariably been more avid product information-seekers than women, though that rift has reduced substantially to less than half the size it was in 2000. This might be a result of the fact that women are relative newcomers to the Internet and had not yet become comfortable with product searches online. Women demonstrated over twice as much growth as men did for this activity between March 2001 and December 2002, at which time 85% of male Internet users said they had searched for product information online, while 81% of female users reported doing so. While there were noticeable discrepancies between the levels of product researching among the various racial groups in early 2000, by the May-June survey period of that year, all groups hit 73%. Since then, there has been relatively equal growth across the board, with each group varying no more than one percentage point from the trend line of all Internet users. In 2000, when the Internet population was still relatively young, online product researching was most common among the 30-49 age cohort. But by December 2002, everyone under age 65 was equally as likely to have searched for product information online. 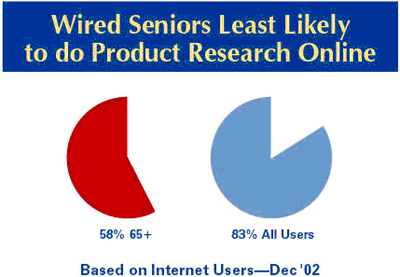 Though wired seniors’ interest in researching products on the Web has grown considerably over the course of our research, they are still the most reluctant to consult the Web for product information. Those users who occupy the higher income and education brackets have been more likely to seek out product and service information online compared to those with lower earnings and less schooling. At the end of 2002, for instance, our survey found that 86% of online college graduates had researched products online, while 78% of users with a high school degree had done so. Similarly, 87% of users in households earning $75,000 or more said they had taken to the Web to investigate a product, while 78% of those with household incomes under $30,000 had done so. Those with the most experience online and those with broadband connections are more likely than others to do product-related research. Long-time users of the Web are most likely to have accessed product information online; in December 2002, 89% of those with 6 or more years of experience had researched a product, but just 66% of those who had been online for under a year did so. Home broadband users have also been more enthusiastic product information-seekers. In the December survey, 92% of those with high-speed access at home and 83% of those with dial-up access had done product research. E-purchasing has been growing steadily, despite the economic slump and drop in consumer confidence. 61% of Internet users have bought a product online as of December 2002. That represents growth of 63% from 41 million Americans who had bought products online as of March 2000, to 67 million who had participated in e-commerce as of December 2002. The number of Americans who make purchases on a typical day online doubled (from 3 million to 6 million) between 2000 and 2002. 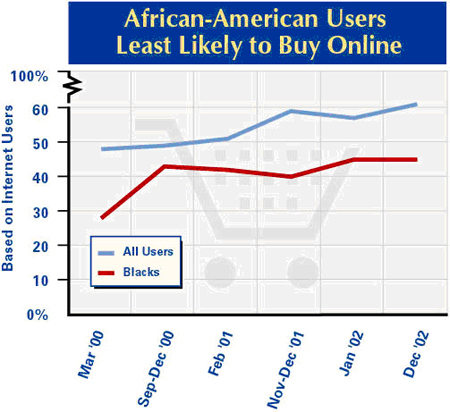 Online African-Americans are among the least likely to make online purchases. Those living in households with high incomes and those with high levels of education are the most likely to buy goods online. Those with the most experience online and those with broadband connections are more likely than others to do online shopping. Despite the economic slump in recent years, e-purchasing has been a steadily growing activity for online Americans. In March 2000, 48% of Internet users, or roughly 41 million Americans, said they had bought a product online. Four percent were doing so on a typical day. Almost three years later, in December 2002, 61% of Internet users had made an online purchase, which translated into about 67 million Americans. Those who were buying products on an average day rose to 5%, reflecting a doubling of the daily online buying population from 3 million to 6 million Americans. The growth in online consumer activity between 2000 and 2002 can also be attributed to the fact that the Internet population was still in the process of maturing. Our research has repeatedly shown that as Internet users gain experience, they are increasingly at ease with making online purchases and are more likely to spend money on the Web. For example, while 67% of Internet users with 4-5 years of experience had bought products online as of December 2002, just 45% of those who had been online for 2-3 years had done so. Online women have caught up to men in online shopping. In our December 2002 survey, 63% of online men said they had made purchases online, while 60% of online women said they had done so. On any given day between March 2000 and December 2002, one would find roughly the same portion of men and women buying products online. Wired seniors, who tend to have less experience online and are less trusting of the online world, have also been considerably less likely to buy products online compared to the rest of the online population. Users aged 30-49 have generally been the most avid online shoppers, but recent data shows that the same portion of both 18- to 29-year-olds and 30- to 49-year-olds (63%) had bought products online by December 2002. Online Americans with higher income and education levels, factors that are also tied to Internet experience, are more apt to be online shoppers. As of last December, 50% of wired high school graduates had bought a product on the Internet, while 71% of college graduates had done so. The income gap was similar; 49% of users in households earning $30,000 or less had tried shopping online, compared to 74% of those living with incomes of $75,000 or more. Home broadband users are more likely to purchase products online and with much more frequency than dial-up users. Four out of five users with high-speed Internet connections had bought a product online in December 2002 compared to three out of five dial-up users. At that time, home broadband users were three times as likely as dial-up users to make an online purchase on any given day. Buying or making a reservation for travel is one of the fastest-growing activities online. 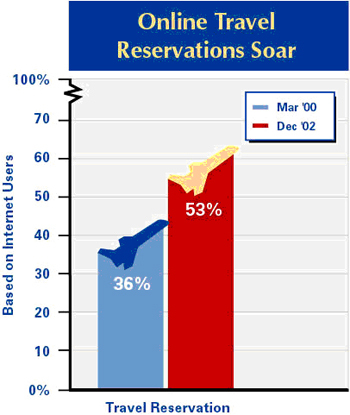 53% of Internet users have made travel reservations online as of December 2002. That represents growth of 87% from 31 million who reported making reservations and other travel purchases on line as of March 2000, to 58 million who had done such activity as of December 2002. Those with college educations and in higher household income brackets were more likely than others to have made travel reservations and purchases online. Those with the most experience online and those with broadband connections are more likely than others to spend money for travel online. Buying and making travel reservations online has been one of the fastest-growing activities on the Web. In March 2000, 36% of Internet users had logged on to make their travel plans. This activity has continued to grow in popularity over the years and by December 2002, we found that over half of all Internet users (53%) had purchased or otherwise secured travel reservations. That spike in activity represents 87% growth during that period — from 31 million to 58 million users — easily surpassing the 63% growth of those who had bought a product online. However, roughly the same number of users (1 million) bought or made a reservation for travel on a typical day in March 2000 as did in December 2002. Making reservations for travel services such as airline tickets, hotel rooms, and rental cars has become an increasingly normalized online activity in recent years. Sites like Orbitz, Travelocity, and Expedia have become the first destination for many Internet users who are considering travel. As Internet users become comfortable with making transactions online and realize some of the conveniences offered by e-ticketing, travel reservation numbers continue to rise. Even for those who are still wary of making travel purchases online, the Internet can help inform these consumers and travelers as they research and plan their trip. Vast amounts of information on transportation, accommodations, and attractions are available online to those who are considering travel. In one of our early surveys (July–August 2000), we asked people if they ever use the Web simply to find information about travel and found that 68% had done so. When it comes to making travel reservations and purchases online, men and women are equally as likely to do so. Each time we ask this question, there is no significant difference in the percentage of male and female Internet users who have done this activity. One distinguishing characteristic of this activity is that it has become equally popular among all Internet users between ages 18 and 64 — a little over half of all these Internet users had booked their travel online in 2002. However, young adults did not dominate as the early adopters for this activity as they have with many other functions of the Web, possibly because they have less disposable income available for traveling or perhaps because they do not have jobs requiring work travel. As is the case with other transaction-related activities, wired seniors continue to trail behind their younger counterparts — about one-third of all Internet users over age 65 have made travel reservations or purchases online. Throughout our surveys, we have repeatedly found that Internet users with higher education and income levels are more likely to go online to make travel reservations and purchases. In December 2002, 67% of Internet users with college degrees had bought or reserved travel services online, compared to just 40% of high school graduates. Similarly, 68% of those in the highest income bracket (Internet users who live in households making $75,000 or more) had booked their travel online, while 36% of users with household incomes under $30,000 had done so. Our data has also shown that veteran users (those with three or more years of experience online) are significantly more likely to book travel online, as are those with high-speed Internet connections at home. There are more people getting financial information online, but the total percentage of users who have sought financial information has not increased. 42% of Internet users have used the Internet to get financial information such as stock quotes or mortgage rates as of September 2002. That represents growth of 32% from 38 million who had reported getting financial information online as of March 2000, to 50 million in who had done so by September 2002. Online men are more likely than online women to have hunted for financial information online. A large portion of Internet users aged 65 and over has sought financial information on the Internet. Those most likely to do financial searches online have higher household incomes and higher levels of education. Those with the most experience online and those with broadband connections are more likely than others to seek financial information online. In March 2000, approximately 38 million online Americans had used the Web to get financial information such as stock quotes or mortgage interest rates. By September 2002, the number of people who had sought financial content online had expanded to about 50 million Americans. Yet, while this activity has seen important growth that has coincided with the overall increase in the online population, the percentage of Internet users who have sought financial information online has changed very little; about four in ten users said they had done this in both our March 2000 and December 2002 surveys. And those likely to get financial information on a typical day decreased slightly during this period (from 15% to 10% of all Internet users). It is clear that more online men than women are drawn to financial information. For example, in September 2002, 51% of male Internet users had sought financial content, while 33% of female users had done so. Similarly, we have also found that men are more likely to buy or sell stocks online. However, in comparison, we have not found the same disparity among Internet users who bank online or those buy products online; men and women are equally likely to do both of these activities. Relative to other Internet activities, the act of seeking financial information online has great appeal to Internet users aged 65 and over; more online seniors surf for fiscal information than buy products or seek religious content online. In our “Wired Seniors” report,46 we noted that online seniors’ enthusiasm for financial content rivaled that of the general Internet population in 2000. Since then, the evidence suggests that seniors’ thirst for financial information has actually been outpacing other users. In September 2002, 52% of users aged 65 and over said they had gone online for money-related information, while just 42% of the general online population had done so. In comparison, the youngest users, who tend to have the least financial responsibilities, are also the least interested in perusing financial information online; only 28% of 18- to 29-year-olds said they had sought financial content. This type of age gap — where oldest users are the most experienced with an activity and young adults occupy the least interested camp — is not common. In fact, looking for financial information and seeking health information online are the only two Internet activities we have tracked for which wired seniors’ usage clearly exceeds that of wired 18- to 29-year-olds. As is the case with other money-related activities such as online banking or buying and selling stocks online, Internet users with higher education and income levels are much more likely to have sought financial information online compared to those with less education and lower household income levels. In September 2002, 33% of online Americans with a high school education had sought financial information online, compared to 54% of college graduates with Internet access. Similarly, just 21% of Internet users with household incomes below $30,000 used the Web as a financial reference, while 59% of those with incomes over $75,000 did so. This difference is also evident in the intensity of usage among these groups; those with the most income and education were three times as likely to seek financial information on a typical day compared to users in the lowest income and education brackets. It is not surprising then that our data show that users with more Internet experience and access to broadband Internet connections at home (factors that both relate to higher income and education levels) are more likely financial seekers than are new users and those with dial-up connections. Online banking has grown more than any other Internet activity. 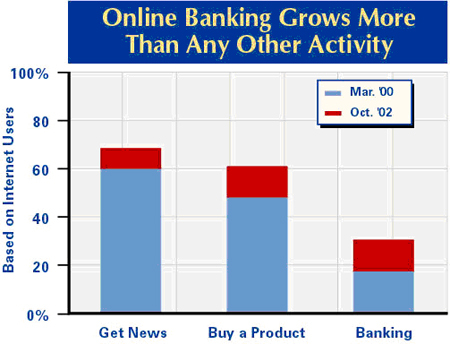 30% of Internet users have done banking online as of October 2002. That represents growth of 127% from 15 million Americans who had done online banking as of March 2000, to 34 million who had done it as of October 2002. The number of people who do online banking on a typical day doubled from 4 million to 8 million Americans between 2000 and 2002. Those with higher household income and higher education levels are more likely than others to have done banking online. Those with the most experience online and those with broadband connections are more likely than others to do online banking. In our October 2002 survey, we found that approximately 34 million Americans, or 30% of Internet users, had tried online banking. That reflects an impressive growth spurt of roughly 20 million Americans since we first started polling this question in March 2000. At that time, only 17% of Internet users (15 million) had tried banking online. But in October 2002, 30% of Internet users (34 million) said they had managed their finances online. As we reported in our “Online Banking” data memo from 2002,47 online banking and online travel purchases — both convenience features of the Internet — grew more than any of the other activities we tracked between 2000 and 2002. While online banking, a fairly novel activity in 2000, had great potential for growth — the 127% increase between 2000 and 2002 is exceptional. Other popular activities, such as buying a product online and getting news online, grew by less than half that rate during the same period. Similarly, the number of users banking on a typical day online grew by 100% (from 4 to 8 million) while daily online news seeking grew by 53% (from 19 to 29 million). Online banking is about confidence as well as convenience. It takes time and experience for Internet users to become comfortable with online transactions and to trust the security and privacy measures put in place by their financial institutions. The longer an Internet user has been online, the more likely he is to migrate his banking to the Web. In addition to convenience, we have found that saving money motivates users to bank online — 30% of e-bankers said in September 2002 that this was a “very important” reason why they decided to bank online. Men have been somewhat more likely to bank online over the course of our research on this activity. We previously reported that, in September 2002, 35% of male Internet users had banked online, compared to 30% of female Internet users. In our “Online Banking” data memo, based on data from September 2002, we noted that there were not substantial racial differences among those who manage their finances over the Internet. And while younger Internet users have certainly been the most ardent about online banking, wired seniors have also come to embrace this activity. Their slow but steady uptake suggests that they are gradually being won over by the potential benefits of banking online. They have consistently been the least likely of all the age groups to go online to take care of their banking needs, but their numbers increase each time we ask this question. Since 2000, more wired seniors started banking online than any other demographic group. Online banking has been driven by Internet users with higher income and education levels. For example, by October 2002, 35% of online Americans living in the highest-income households ($75,000 or more a year) were banking online, compared to just 21% of users in the lowest-income households (less than $30,000 per year). Education also figured in the mix; while only 27% of Internet users with a high school education had used Internet banking, 37% of users with college degrees had done so. Those with broadband connections are more likely than others to do online banking. In October 2002, 43% of broadband users vs. 29% of dial-up users said they had done some of their banking online. Relatively few Americans buy or sell stocks, but the numbers have increased. 12% of Internet users have bought or sold stocks online as of September 2002. That represents growth of 40% from 10 million Americans who reported they had done online stock trades as of March 2000, to 14 million who reported such activity as of September 2002. 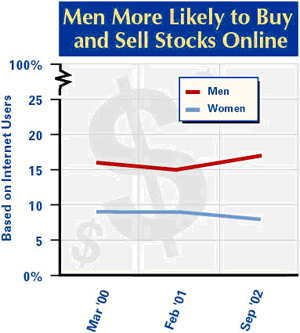 Online men are more likely than women to do online stock trading. The highest incidence of stock trading online takes place among those with high household incomes and high levels of education. Those with the most experience online and those with broadband connections are more likely than others to trade stocks on the Internet. Between March 2000 and September 2002, the population of Internet users who go online to buy or sell stocks, bonds, or mutual funds grew by approximately 4 million people. However, the proportion of Internet users who say they trade financial investments online did not change noticeably; at any given time since we have asked about this activity, about 12% of online Americans say they have bought or sold stocks online. A much smaller portion — between 1% and 3% of Internet users — make these exchanges on a typical day. The downturn of the stock market in recent years has likely had an impact on the conservative growth of online trading. Still, sites such as Scottrade.com and Ameritrade.com have been well-trafficked destinations for Internet users looking to manage their financial investments online and save money on transaction costs.48 Online trading services such as these often provide deep discounts on the charges normally associated with brokering offline. Just as men show more interest in seeking financial information online, male Internet users are more likely than women to have bought and sold stocks online. In fact, they have been twice as likely to do so during any given survey period when ask this question. Most recently, in September 2002, 17% of online men had made stock exchanges, compared to just 8% of online women. Age does not figure very significantly in this activity. However, users aged 30-49 took the lead on buying and selling stocks via the Web in 2002. On the other hand, those with higher incomes and educational attainment are considerably more likely to have done online trading than other Internet users. In September 2002, 17% of Internet users holding college degrees had exchanged stocks online while about half as many of those with a high school degree or less had done this. Twenty percent of Internet users living in households with combined incomes of $75,000 or more had bought or sold stocks — that is four times as many compared to users who fall into the lowest income bracket (households earning less than $30,000 annually). Just 4% of these users had tried online stock trading in September 2002. Over time, we have also found that experienced users gravitate more towards this activity. Not unlike what we have found with online banking, entrusting the transmission of important financial information to online services is not something Internet users take lightly. We have found that it takes time for Internet users to build up trust of the medium and those who engage in this type of financial activity are most likely to be veteran users. Those with high-speed Internet connections at home, which can speed up the real-time transmission of stock information, are more likely than other users to buy and sell stocks online. In September, twice as many users with home broadband connections (20%) had made these financial exchanges online compared to dial-up users (10%). Online auction activity has nearly doubled in the past 3 years. 22% of users have participated in an online auction as of December 2002. That represents 85% growth from 13 million Internet users who had participated in auctions as of March 2000, to 24 million who had done so as of December 2002. 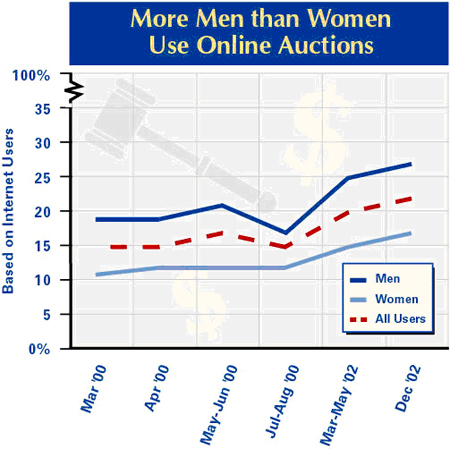 Online men are more likely than women to have participated in auctions on the Internet. A higher proportion of young adults with Internet access have participated in online auctions compared to older users. Those with more education, Internet experience, and higher incomes are more likely to participate in online auctions. Online auction activity has nearly doubled over the course of the past 3 years. In March 2000, a modest 13 million American Internet users had placed a bid, bought an item, or sold an item through an auction Web site. But by December 2002, there were 24 million Americans who had exchanged their wares online. However, those who are likely to participate in auctions on a typical day grew only marginally from 3 million to 4 million people between 2000 and 2002. While the e-Bay phenomenon has undoubtedly fueled the popularity of online auctions, Yahoo! Auctions and Amazon’s auction sites are also popular sites for bidding online. Users who flock to these and more specialized auction sites find and sell everything from clothing and electronics to rare and weird collectibles one would otherwise be hard-pressed to locate in an offline store. By about a 10-point margin, a greater percentage of male Internet users take part in online auctions compared to female Internet users. This discrepancy is similar to the gender gaps we have observed in other transaction-related activities online. In December 2002, this meant that 27% of online men had engaged in auctions, while 17% of women had done so. African-American and English-speaking Hispanic Internet users are less likely to say they have participated in online auctions compared to white users. But younger users — who tend to be more comfortable with online transactions — are more likely to have used online auction sites compared to older users. As large numbers of young Internet users continue to saturate the online population, the difference in auction activity among various age groups has become more pronounced over time. In December 2002, 25% of wired 18- to 29-year-olds said they had taken part in an online auction, but just 15% of wired 50- to 64-year-olds said they had done so. As is the case with other activities that involve financial transactions, those with more education and higher household incomes drive the trend. Additionally, parents are more likely than non-parents to buy or sell items through auction sites, and veteran users (those who have been online for 6 years or more) are more likely than new users to participate in auctions on the Web.